Many people are not aware of where their food comes from. Strong communities can only be achieved through access to affordable and nutritious food. communities in a precarious situation. This will only be exasperated by severe weather events caused by climate change. 1.3 metric gigatons of edible food goes to waste every year and at least 795 million people are undernourished worldwide. Canada is among the worst globally in wasting food, according to a recent report released by the Commission for Environmental Cooperation. Including all stages of the supply chain, 396 kilograms of food per capita is wasted in Canada every year. Food waste is also a large contributor of Greenhouse Gases, mostly in the form of methane, a pollutant at least 25 times more potent than carbon dioxide. A lack of affordable nutritious food is causing serious health issues. By buying in bulk and frequenting inexpensive fast food outlets, we are eating much more than previous generations and still gaining less nutrients. These choices are key contributors to obesity, diabetes, and consequent cardiovascular diseases. Over the past two decades, rates of overweight and obesity have more than doubled for Canadian adults, and nearly tripled among Canadian children. Rural and especially remote, northern communities have higher prices than more central areas and poorer availability of nutritious foods. An Environment Canada report found that 30% of Déne/Métis, 44% of Yukon First Nations, and 60% of Inuit women reported that their families could not afford to buy all the foods they needed from the store. Proper health and well-being is dependent on having access to affordable nutritious food. According to Canada's census in 2011, 55.2% of Canadian farmers were above the age of 55 and only 9.9% were less than 40 years old. 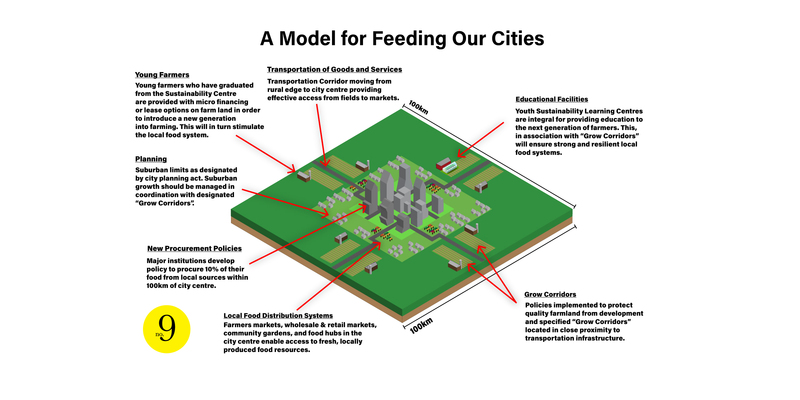 With larger barriers to entry, such as increasing farm sizes and costs, who will feed our cities? Young farmers interested in starting their own businesses are faced with increasing expenses and decreased quality of accessible farmland. Farmland prices in Canada have increased nationally by 132% since 2007. Based on Statistics Canada Data, on average price per acre in farm size, the average farm goes for 2.2 million, making ownership by young farmers all but impossible without assuming debilitating abouts of debt. Prime agricultural land within close proximity to urban populations is under threat from suburban development. A study by Statistics Canada found that only 5% of Canada's entire land base is suitable for growing food and each year we lose 25,000 hectares of prime farmland to urban expansion. There is currently no national land-use plan in Canada. These plans which contain high-level objectives and policies for land use, growth management, environmental protection, infrastructure, and economic development are all operated at a regional scale. In many cases, they vary depending on the province which leaves some regions vulnerable to mismanagement of prime agricultural land. allow for the development of a global model for creating local sustainable food systems. More than half of all food waste occurs along the supply chain, supporting and buying locally helps reduce this impact. No.9 Gardens will focus on supplying the local community with a variety of fresh produce, as well as educating students and visitors from the general public on the techniques of diverse farming. By focusing on educating younger farmers to grow produce that can serve the local community, more local farms will be established, decreasing the dependence on importing food that contributes to food waste and GHG emissions. The solution to having access to affordable nutritious food is to grow it yourself. No.9 Gardens will train the next generation in organic farming methods and utilize innovative solutions in the latest developments in urban and remote location farming. Students from a variety of communities, including rural and remote, will be engaged in on-site internship programs at No.9 Gardens. Through a mentorship structure, these interns will gain the knowledge that is required to grow significant produce for themselves and their communities. No.9 Gardens will act as a resource of support and structure that will allow for long term improvements in communities most in need of affordable nutritious food. 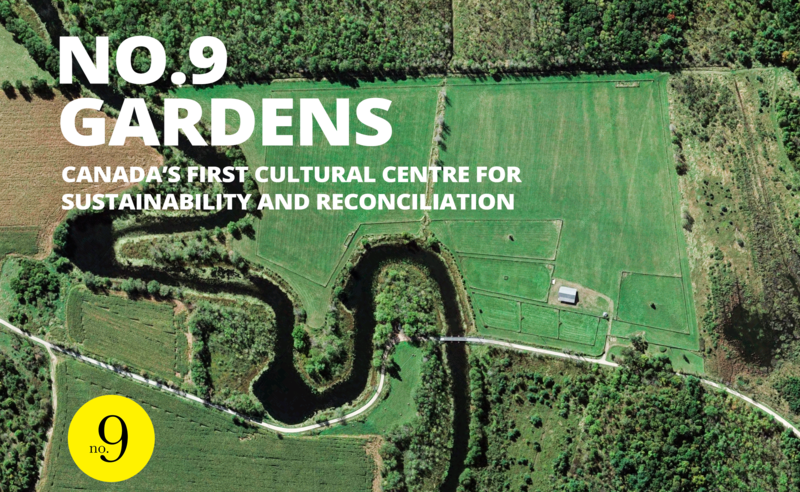 In partnership with the Dunin-Deshpande Queens Innovation Centre and the St. Lawrence College School of Skilled Trades and Tourism, No.9 Gardens will focus on engaging the next generation of farmers that will fill the gap in Canada's agricultural industry. No.9 Gardens will achieve this goal by providing farmer apprenticeships, workshop activities, and farm management programs. Through support and inspiration, students will recognize the varying opportunities of running profitable local small-scale organic farms and the rewarding lifestyle that they can bring. No.9 Gardens will provide young farmers with the base knowledge and economic understanding of how to run a profitable organic farm. This will better prepare them to enter into Canada's agricultural industry. To combat the heavy cost barriers associated with buying a farm, graduates of No.9 Gardens programming will be introduced to alternative and innovative solutions to securing farmland. These include: rent to own, leasing, on farm employment, business partnerships in agriculture, and farmland easement agreements. We need to develop new policies that will protect valuable agricultural land so that we can help local farms feed the growing demand from our cities. Municipalities and institutions need to employ local food procurement policies to provide the economic structure required to support local farming. These policies will also contribute to economic development in rural areas surrounding our urban populations. No.9 Gardens will actively participate in encouraging the development of a federal land use policy that protects prime agricultural land from being developed. No.9 Gardens is currently working with its partners and elementary schools in Brockville and Kingston to develop workshop and field trip opportunities for the spring of 2019. Updates coming soon! OUR FUTURE DEPENDS ON THE NEXT GENERATION OF FARMERS.